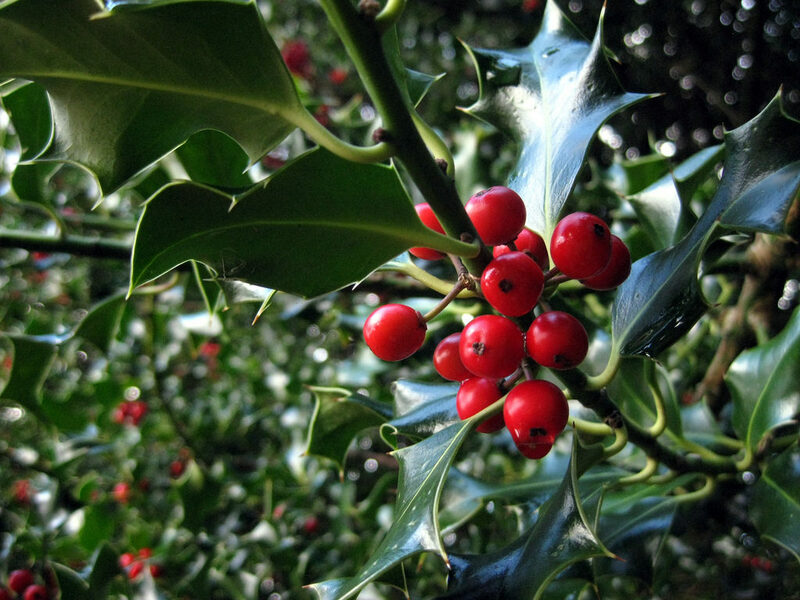 Read on to discover six beautiful winter walks in south-east Hampshire. I’ve included detailed descriptions, maps and where to get refreshments along the way. With its pretty villages, chalk streams, rolling downland, wide valleys and ancient forests, south-east Hampshire is a great place to go for a walk on a crisp, clear winter’s day. Especially if you finish up warming up with a cake in a cafe or with a beer by a roaring fire in a pub. I spend a lot of time at weekends walking my Border Terrier Tilly around some of the county’s thousands of miles of footpaths, bridleways and tracks. Here are six of my favourite winter walks in south-east Hampshire, complete with walking directions, maps and – importantly – information on where to refuel afterwards. The walks listed here range from 1.5 miles to 6.5 miles in length. 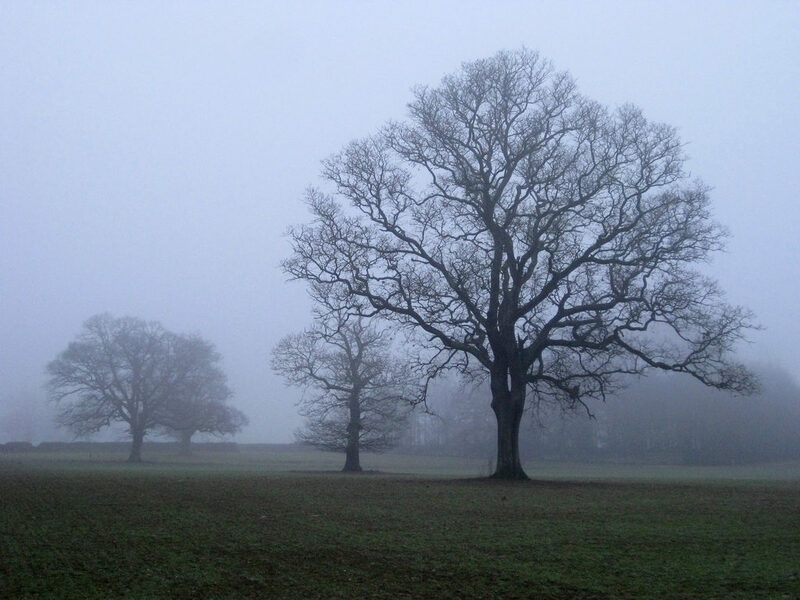 This walk begins under the trees in a small car park at Beacon Hill – a nature reserve near the villages of Exton, Warnford and Corhampton. The start of the walk is on the South Downs Way as it heads towards Sussex where there are some fantastic views over to Southampton, the New Forest and the Isle of Wight. Then, as you continue along the track there are also views of Old Winchester Hill and the Meon Valley as it cuts through the landscape below. After a steep drop into the pretty village of Exton, the route heads up past the “Punch Bowl”, a picturesque dry valley that rises back up towards Beacon Hill and through woodland to the base of Betty Mundy’s Bottom, a partly wooded, shallow valley on the Preshaw Estate. Apparently, the Romans named this area “Beati Mundae” which is loosely translated as “the most blessed place in the world”. I’m not sure about that, but it is very nice. Another story says that a lady named Betty Mundy once cursed a herd of cattle. So local people burnt down her cottage while she was still in it. These days, she’d have probably just received a police caution. After you’ve passed through Betty Mundy’s Bottom (which is nicer than it sounds, despite the slight incline) the walk takes you back onto the South Downs Way to the car park at the peak of Beacon Hill. There are no stops directly on the way round. But The Shoe Inn (01489 877526) in Exton is a short stroll off the route – just take a left when you first get into Exton and head right after the church. It’s easiest to the car park from the B3035 Bishop’s Waltham to Corhampton road. 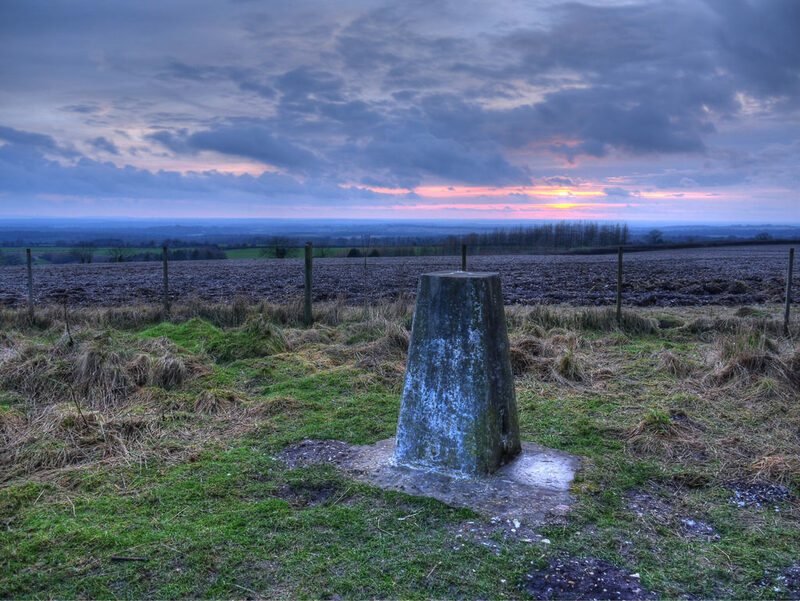 The turning up to Beacon Hill is on a crossroads, just under three miles from Bishop’s Waltham (on the left) and about one mile outside of Corhampton (on the right). The turning is by a small red post box. The car park is then about 1.5 miles up this lane, on in bend. Facing the road from the car park, go left through the gate and along the track for just over 1/4 mile. Take the path signed “South Downs Way,” through the gate and down to the road. Then take the path on the left, down the hill (with the beacon on your left). Continue on this path down into the valley. You’ll pass through several gates and stiles and you’ll reach the village of Exton after about a mile. When you reach the road in the village, go right. At the next junction, go right, then follow the road around to the left along Allens Farm Lane. After about 250 yards, the road goes sharply right. Stay on the road here and continue on it as it turns into a track. You’ll reach a road with some cottages on your left, after about 3/4 mile. Cross the road and take the footpath straight ahead. After just under 1/4 mile, there’s a wide gap in the trees and hedgerow on your left. Slip through here and then stay to the right of the field. Go into the woods. The path goes left, then right into a small opening. Keep straight as the path turns into a logging track. The track narrows, then you’ll reach a lane. Cross this and continue on the footpath. Stay right. At the track, go right and follow the path through the valley, across a track and into the woods. Follow the path through the left-edge woods along the wooden fence until you come out in a field. Hug the right side of the field until you reach the top corner. Then go through two gates on your right, across another track. Stay on the left-side of the field. Ignore the first gap in the trees. Take the path that goes through the second gap. When you come out in the field, head right and aim for the gate at the bottom of the wood on your left. Hop over the stile and pick up the track on your left. Follow this as it curves round to the right, just inside the wood. Ignore the track that heads off to the left, about half way along. When you come out in the field, head straight across and take the path along the top of the small ridge that runs up the field. Take the track up past the farm buildings and then go right. Follow this track for about 1/2 mile back to the road. The car park is a short walk along the road. There’s something haunting about encountering abandoned railways. This short walk gives you an idea of the picturesque views you would have enjoyed on the Botley to Bishop’s Waltham branch line, before it closed to passengers in 1932. It starts in a lay-by on a quiet road between the villages of Curdridge and Boorley Green. Then, after a short walk along a narrow lane, you head into fields that give you a view of the upper reaches of the River Hamble, which is no more than a wide stream at this point. Next comes a stroll through a wood, which takes you to the Grade II listed Durley Mill. This is now a private house, so you can’t see too much of the waterwheel, which was added in 1875. But there are still glimpses of this historic building as you cross the two new wooden bridges that span the river and the artificial channel that feeds the mill. 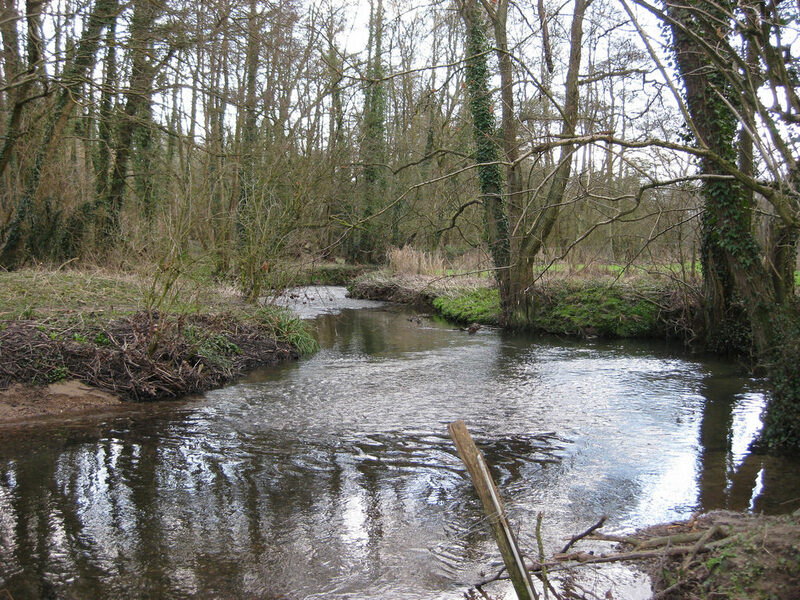 From the river, you head up towards the site of the old Durley Halt railway stop. This was built in 1910 to serve the village of Durley and the mill, although it’s hard to imagine any flour being carted up this muddy track. The walk then takes you over a stile and into another wooded area alongside the old railway earthworks. But before you take this path, it’s worth walking up a few yards to the old railway crossing. A lady named Alice Elliot was responsible for looking after this from 1907 until she retired in 1954. The old white crossing gate is still there, unlike Ms Elliot’s track-side cottage which was demolished soon after the rails were lifted in 1962. Back on the route, you enter a large field after you come out of the wooded path, which then takes you to a long driveway. Here, there is often a selection of preserves and eggs for sale from a hatch outside one of the bungalows. At the end of the driveway, you next wander back down the hill and under the old railway bridge back to the lay-by and the start of the route. This does involve walking along a minor road for around 1/4 mile, but it’s relatively quiet. There are no pubs or cafes en route. However, Botley is about 1.5 miles from the start/finish point. There you’ll find the cosy Cracklerock brewery tap room and Elsie’s Tearooms (01489 781950). There are also several pubs in nearby villages, including The Farmer’s Home (01489 860457) in Durley and The Cricketers Inn (01489 784480) in Curdridge. There’s a lay-by on either side of the road for easy parking. To get there, head to either Boorley Green or Curdridge. At Boorley Green, look for Maddoxford Lane off the B3354 – this is between the Botley Park Hotel and the railway bridge. The lay-bys are around 3/4 mile down this road. From Curdridge, look for Wangfield Lane off the B3035 (Botley to Bishop’s Waltham road). This is on the right, immediately after the church if you’re coming from coming from Bishop’s Waltham. Or the second turning on your left if you’re coming from the junction with the A334. The lay-bys are about 3/4 mile from the main road. From the lay-by, head right up Netherhill Lane. After just under 1/4 mile, cross the stile to your right and take the path that hugs the right-hand side of the field. At the stile/gate, continue along the path – this follows the hedgerow on the left-side of the field. You’ll then enter a third field – follow the path straight across until you enter the woods. Follow the path here until you reach another stile, which takes you down to the road. Go right and take the path on the corner of the road. Cross the two bridges. After the second bridge, take the stile on your right. Follow the path through the woods. When you come out in the field, stay on the left-side of the field and pick up the driveway. Follow this until you reach the road, then go right. This takes you back to the start. If you were to take a dusk walk on the hills in east Hampshire 70-odd years ago and look towards the coast, you might have seen the agonising sight of the Luftwaffe dropping bombs on Southampton or Portsmouth. Radar was a recent invention in the 1940s and it certainly gave our air defences an indication that the enemy was on his way. But it was the work done by the “eyes and ears of the Royal Air Force” – The Royal Observer Corps – that provided information on the size of air raids like these and the likely destination for their hundreds of bombs. Without this, many more people would have died and Hitler’s bombers would have inflicted a lot more damage on the British war machine. On the face of it, the job of the people of the Royal Observer Corps – many of them volunteers – was actually quite simple: Look to the skies and report back on enemy aircraft movements. But, the reality was much more complicated than this, with observers trained how to identify an aircraft by the sound of its engine or the shape of its silhouette, or how to use special equipment to measure an aircraft’s speed, height and location. They then telephoned their observations through to operations rooms so that the RAF could send up fighter aircraft to engage the bombers and so that towns and cities could sound their air raid sirens to get people off the streets. Many of the unsung heroes of the Royal Observer Corps did their work from bunkers dotted around the countryside. Most have these have now been filled in, but one of them still exists just outside the village of Upham, on the edge of the South Downs National Park. The bunker is situated on a public footpath and there’s a pleasant walk that you can take that passes right by it. The walk begins at the small car park at Upham recreation ground. You then head north-east along a shaded farm track, which has some gorgeous views into the valley below. Next, it’s onto a hillside brimming with newly-planted trees. This is a great spot for a rest as there are some more views over the downs and a couple of benches you can perch on when the ground is damp. You’ll also see families of pigs relaxing in the muddy fields below. You then hug the border of the next-door field, which eventually brings you to the bunker, hidden in a small copse of young trees. You can’t get into the bunker anymore, but it does give you an idea of what it was like to perch at its access hatch for hours on end, scanning the skies above Hampshire for aircraft. There’s also an information board with more about life as an observer here. You then join up with the original path near the recreation ground, to make your way back to the car park – a route that observers would have also taken after an eight-hour stint in the bunker, 70 years ago. It’s easiest to get to Upham from the B2177 Bishop’s Waltham to Colden Common road. When you enter Lower Upham village on the main road, look for signs for Upham – the turning is next to the Woodman pub. You’ll see the car park and the rec ahead of you, after a few hundred yards. No refreshments on the route, but the Brushmakers Arms (01489 860231) is in the centre of Upham, a short walk from the car park. There’s also some pubs in nearby Fisher’s Pond and various pubs and cafes in Bishop’s Waltham. From the car park, head past the recreation ground buildings and pick up the track on the left-hand side of the football pitch. After about 1/2 mile, at the start of a short descent, take the path on your right. This goes into a narrow field of young trees. Follow this path for 1/4 mile, then go right into the adjoining field. Hug the left-edge of the field until the hedgerow ends. You’ll then see the small copse of trees that contains the Royal Observer Corps Bunker in front of you. Follow the path back to the track you walked on earlier. Turn left to go back to the recreation ground. This varied four-mile route includes spectacular views of the Meon Valley, as well as the Isle of Wight and Southampton. 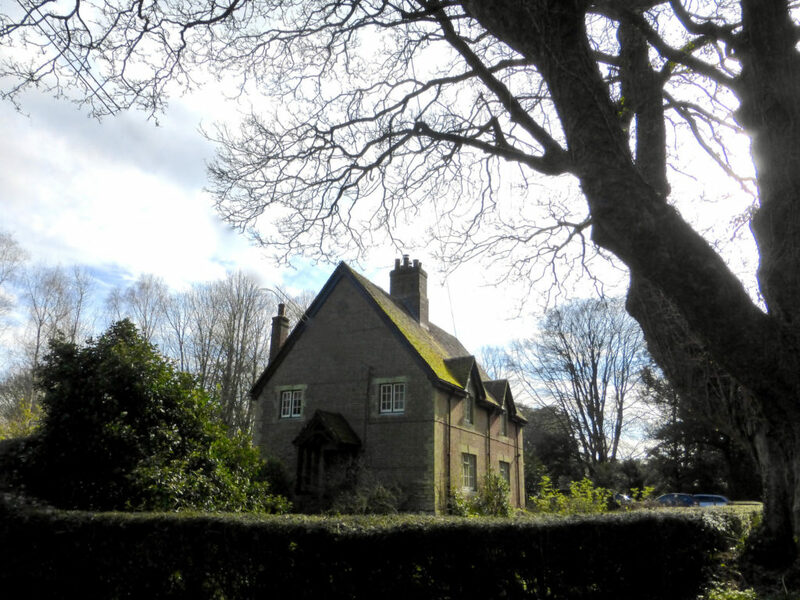 It starts on a quiet lane near the historic Swanmore Park House and passes the pretty cottage gardens of Upper Swanmore along a farm track called Green Lane. This section has far-reaching views over to the Isle of Wight, as well as the power station at Fawley 11 miles away. You then head into a pretty valley and pick up a quiet lane that runs over the brow of the ridge a hill overlooking the village of Droxford in the Meon Valley. After a steep shimmy down some wooden steps into the fields below you slip up through a small wood onto a peaceful meadow to pick up a section of the Wayfarer’s Walk footpath. Gaps in the hedgerows provide more teasing glimpses of Droxford, Beacon Hill and Old Winchester Hill as you start the climb out of the valley. Next, a bridleway carries you towards Dundridge, providing yet more far-reaching views, this time of the tower blocks of Southampton at the very end of the valley. The last section of the walk is along a wide path on the edge of some woods and up a final short but steep hill to the start at Upper Swanmore. Continue on this road for about a mile until you reach a T-junction at the top of the hill. There’s some space to park a car or two on the side of the road near this T-junction. Just be careful not to block the gateway. There aren’t any stops on the walk itself, but The Hampshire Bowman pub (01489 892940) is a short detour from point 12 (see below). Look for the wooden footpath sign in the woods and go right until you reach the road. Then go right again. The Hunters Inn (01489 877214), which boasts a resident ghost, is a short drive from the start of the walk, in Swanmore. There are also plenty of pubs, cafes and restaurants in nearby Bishop’s Waltham. At the grass triangle (after about 1/4 mile) go left and then take the first turning left at the next grass triangle, onto a track, through some trees. Follow this track for about 2/3 of a mile until you reach a road next to a large thatched house. Go left. When the road split in two, keep straight. Follow the road for just under 1/2 mile until you see a steep footpath, on your left, before a wooded area. Take this path down the steps, then go left at the bottom and follow the path around the edge of the field until you get to a small wood on your left. Go into the wood, through the kissing gate. Follow this path along the bottom of a narrow field for just under 1/2 mile. When you reach a track at the end of the field, take the path left into another small wood. You’ll come out in a field that has motocross track on your right-hand side. Keep left as you walk up the hill. The edge of the field then goes right and then left. Follow the edge of the field to the road. Cross the road and take the bridleway straight in front of you. Continue on the path along the edge of the wood. Just after a wooden footpath sign (which marks a footpath off to your right) the path that you’re on splits in two. Stay left here. When you get to the top of the hill, go left at the road until you get back to the start of the walk at the T-junction. Not only is the Hinton Ampner estate between Winchester and Petersfield a great place to see the autumn colours and bluebells, but it’s also a beautiful location for a walk in winter. The National Trust owns the house, gardens and estate. And while you need to pay to see the gardens, there’s a multitude of public rights of way and permissive paths throughout the estate. This walk provides a glimpse of the 18th-century house and gardens. It also includes stretches in the surrounding parkland, including some paths that have only just opened to the public. From the house’s main visitor car park, you head through the village the house is named after and go east towards Bramdean where there are some commanding views of the surrounding countryside. It’s near here where Parliamentarian Roundhead’s camped overnight before 1644’s Battle of Cheriton in the English Civil War. You then descend a hill into a shallow valley and pick up a quiet lane that runs up towards Joan’s Acre Wood. This is named after Joane Dutton, the sister of the last owner of the estate. Next, you begin looping back to the house with a stroll through the woods on the right side of the road. Here there are many specimen trees to look out for including some giant redwoods. Part of the marked path also includes an imposing and impressive avenue of beech trees. Finally, the walk takes you along the bottom of the valley and along the border of the house’s gardens to the village church. This was also the site of the original Hinton Ampner house, which the owners pulled down in 1793 due to a severe haunting. As you do. Hinton Ampner is easy to get to. It’s a few hundred yards east of the village of New Cheriton on the A272 between Petersfield and Winchester. There aren’t any stops on the walk itself but there are a few places that are nearby including the Flower Pots Inn (01962 771318 ) and the National Trust cafe in the grounds of Hinton Ampner House (01962 771305 – admission fee applies). In the car park facing the entrance to the house and gardens, head left to the stile in the hedgerow. At the road, go right and follow the road through the village for just under 1/4 mile. When the road bends sharply to the right, continue straight through the farm and into fields. After about 1/2 a mile you’ll see a small, narrow copse in front of you where two rights of way cross each other. Go right and follow the path down the hill to the road. At the road, go right past the cottages then immediately left up the lane. After just over 1/2 a mile you’ll see a gateway into the woods on your right-hand side. Go through here and follow the purple markers through the woods. After a mile or so you’ll come out of the woods onto a bridleway. Head left and cross the road. You’ll soon see the house on your right. Before you reach it, take the path that runs up alongside the gardens to the church. Pick up the road you walked earlier and then head back over the stile to the car park. 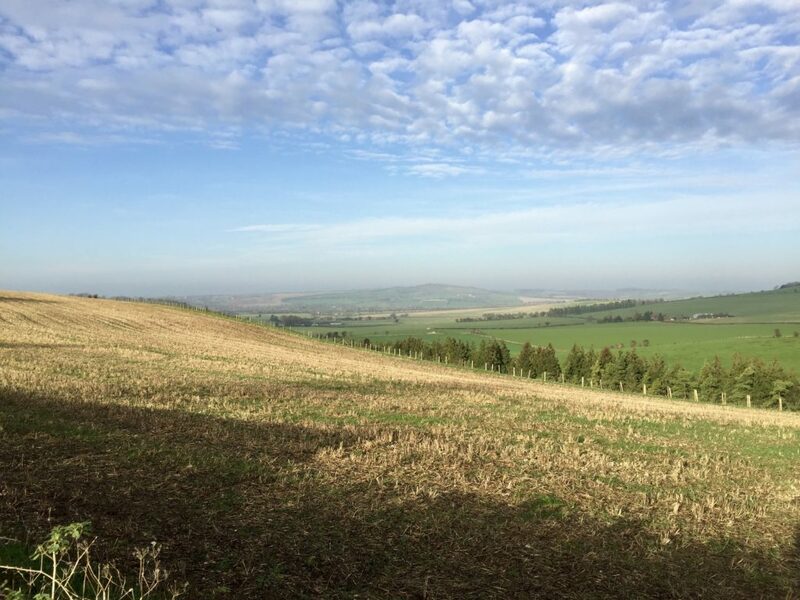 Rather than take you to the peak of Old Winchester Hill with its views over the Meon Valley, this walk takes you through the less-well-trodden valley to the east of the Iron Age hill fort. It’s a stunning walk on a hazy winter’s morn. Parking is in the main car park. From there you head first along the road and then through a small copse and down a steep hill along the Monarch’s Way long-distance footpath to the valley below. 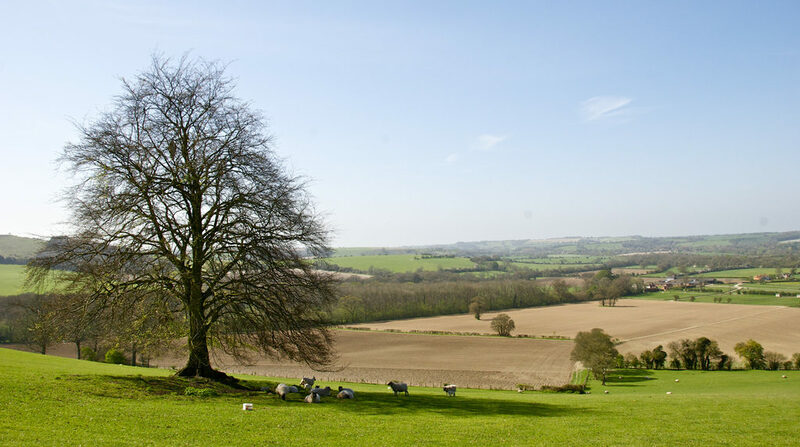 At the end of the valley is Meon Springs, a kind of mini countryside resort that provides fly fishing, clay pigeon shooting, camping and more. Here there’s a small fishing lake plus a quaint cafe offering hot drinks, sandwiches, homemade cakes and a warming wood-burning stove where you can boost your energy levels before the ramble along a chalky track up the side of the hill back to the top of the ridge. 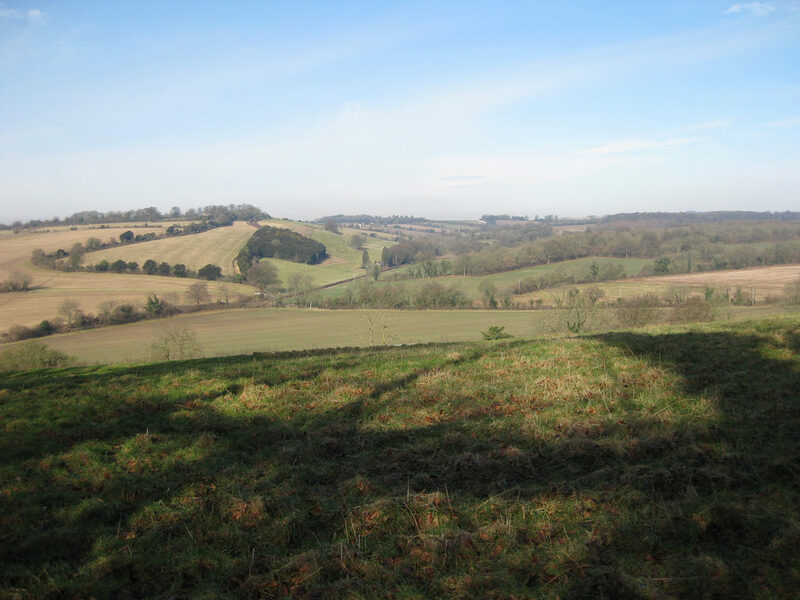 At the top, there are great views across the Meon Valley before you head back along the path to the car park. Park at the main car park for Old Winchester Hill. It’s clearly signed from the A32 at Warnford. 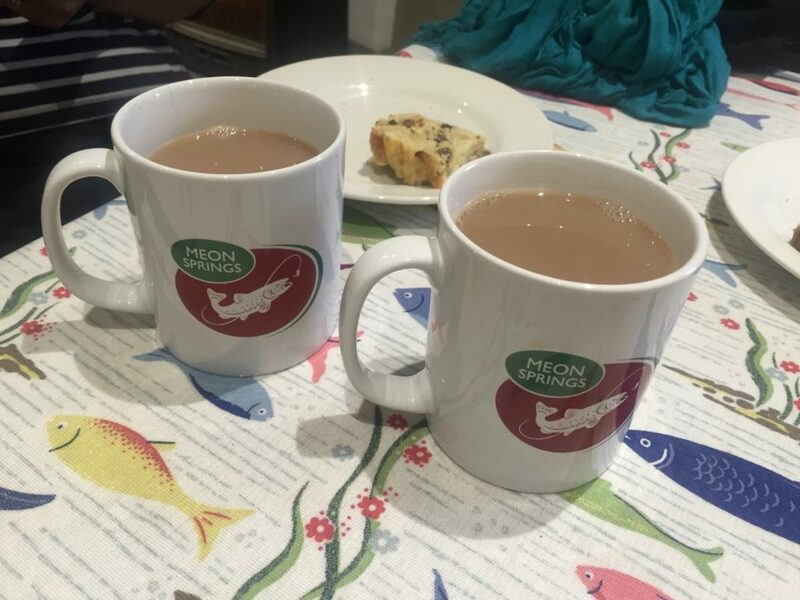 The cafe at Meon Springs is cosy and good value for money. You can also head to the George and Falcon pub (01730 829623) in nearby Warnford afterwards. From the car park, head for the gap in the corner of the car park and walk along the path towards Old Winchester Hill. After almost 1/2 a mile, the path goes right next to a gate to the road. Go through here and continue along the road. Just shy of 1/2 a mile, there’s a stile on your left in front of a small copse. Enter the field and follow the path through the copse. When you come out of the trees, head down the hill to the stile at the bottom. Then go left towards the houses. Follow the track through the farmyard until you reach the South Downs Way. If you want to visit the cafe at Meon Springs, go right for about 400 yards. Go left towards the ridge and follow the track as it climbs right up to the top of the hill. At the top, take the path on the side of the road back to the car park. Have you done any of these six winter walks? Where are your favourite places to walk in the winter months?